This review first appeared in the October 4, 1997 edition of the American Reporter. Rahsaan Patterson has been on the urban music scene for years  it's just been as a backing vocalist and songwriter instead of an artist in his own right. He's written songs for Brandy and Tevin Campbell, he's sang behind George Duke and Stanley Clarke. And Patterson's got a great voice  rich timbre, decent range, a nice smokiness that reminds of Steve Wonder. And this collection of songs from Patterson's pen are accessible and fun; about a third of the 14 could easily become hits. The only drawback in all this is that Patterson never stakes his ground  never takes command. He gets in a nice, funky groove, but it's all kind of indistinguishable from other stuff out there. 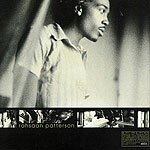 You can hear some Junior and some Prince and a dozen others; which of it is really Rahsaan Patterson? Patterson's got as much talent as anyone  what he needs to get to the next level is to develop a personal style that marks anything he touches instantly identifiable, to make him stand out from the crowd. Given his talent, let's hope he gets on it.